. A woman is dead after a pedestrian-train accident on Christmas Eve, police said. 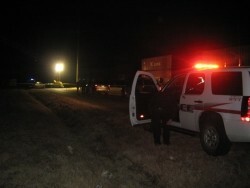 The accident occurred late Friday night on the train tracks just North of the Fourth Street Crossing. Nearly all rail crossings throughout the city were blocked for several hours, awaiting the arrival of a medical examiner. The only tracks open were SE 5th and Hurliman Rd. Information was not immediately available on details of the situation or the identity of the victim. The victim is from Guymon but police are waiting until all next of kin are notified to release the woman’s identity.